Taldou (also spelled Tall Daww, Taldo or Taldao, Arabic: تلدو) is a town in the Houla region of northern Syria, north of Homs in the Homs Governorate. Nearby towns include Kafr Laha to the north and Kabu to the southwest. In 2004 it had a population of 15,727 according to the Syrian Central Bureau of Statistics. Taldou was the scene of the Houla massacre in which 108 civilians, including 49 children and 32 women, were killed, allegedly by Syrian Army shelling and ground attacks by pro-government Shabiha militiamen, while Syrian government had accused extremist Islamic groups for perpetrating the massacre. A central feature of all Syrian cities and towns. Marks the central point. 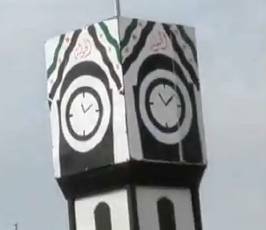 In Taldou the clock tower is located at the intersection at the northern end of Main Street, south east of the Al Shohada mosque. 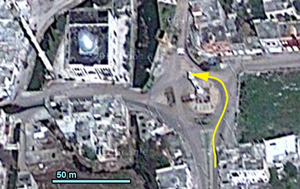 Renamed by revolutionaries as "Freedom Roundabout"
Top of mock clock tower on "Revolution Square"
A piece of waste land in the intersection of a side street and a dirt road in the northern part of town near the new mosque. The center of rebel-held Taldou, a site of weekly anti-Assad protests. Symbolically raised to the status of "town square" with the erection of a mock clock tower replica. The burial site of the massacre victims. Located in northern part of town, possibly poorer neighborhood. Built some time between 2007 and 2010. 530 meters east of clock tover. Shelled on April 5th, 2012. Around three kilometers north-northeast (map) of the Taldou roundabout, on the outskirts of Houla area. Damage to school from return fire. "فري برس حمص الحولة استهداف عصابات الاسد لخزانات المياه 22 4 2012 Homs Syria"
↑ U.N. condemns Syrian killings; toll in massacre rises as violence goes on CNN, May 27, 2012. See also SANA reportwebcache "Al-Qaeda-linked terrorist groups committed two horrible massacres against a number of families in the towns of al-Shumariyeh and Taldo in the countryside of Homs province, in escalation of their crimes that comes usually before Security Council sessions on Syria and this time in coincidence with the announced visit of the UN envoy to Syria Kofi Annan." This page was last edited on 1 October 2017, at 18:53.